Family: Loganiaceae R.Br. ex Mart. This species is accepted, and its native range is Tropical & S. Africa, W. Indian Ocean. Deciduous shrub or small tree, (0·30)1–6(10) m. high, sometimes flowering on first year shoots (with small leaves) on old fire–cut stumps. Trunk 4–15 cm. in diam. (sometimes Huted), branched from below; bark pale to dark grey or brown, shallowly fissured, not or sometimes thinly corky, often scaly, sometimes blackened by bush fire, not lenticellate; wood hard, whitish, without bark–islets. Branches sometimes deeply ringed at nodes, grey or brown, not lenticellate, often with curved or straight spines; branchlets glabrous or pubescent, green or yellow–green when fresh, green or brown and often sulcate when dry, sometimes terminating in a straight spine. Leaves on main axis sometimes ternate; petiole 2–10 mm. long, glabrous or pubescent; lamina coriaceous also when living, young thinner and papyraceous when dry, very variable in shape and size, orbicular, elliptic, narrowly elliptic, ovate, or obovate, 1–2(3) x as long as wide, sometimes comparatively wider or narrower on main axis, usually comparatively wider on flowering branches, 1·4–9·5 x 1·2–7·5 cm., rarely larger, up to 13·5 x 7·5 cm., emarginate, rounded to acute and often apiculate, sometimes acuminate (mostly in trees along water courses), or rarely abruptly acuminate at the apex, cuneate, less often rounded, or sometimes on main axis subcordate at the base, often with hair pockets in the angles of the main veins beneath, glabrous or pubescent on both sides (in sucker shoots and seedlings of plants with few hairs more hairy, smaller and cordate); 1–3 pairs of distinct secondary veins from above the base curved along the margin. Inflorescence terminal, seemingly umbellate, congested or less often not, 1·5 x 1·5–5 x 3·5(6–5 x 7) cm., mostly many–flowered. Sepals pale green, connate at the base, narrowly triangular to linear, equal, subequal, or sometimes unequal, 2–6(10) x as long as wide, 1·5–6 x (0·3)0·5–1·2 mm., acuminate or subulate at the apex, minutely ciliate at the base or not, outside mostly sparsely pubescent at the base and glabrous at the apex or entirely glabrous, never with an even indumentum all over, inside glabrous and usually with some hairs at the base or sometimes minutely pubescent, without colleters. Corolla when mature 0·8–2·7 x as long as the calyx, .4–5(3·8–6) mm. long, pale green, greenish, or less often white, creamy, or yellow, glabrous or sparsely pubescent outside, inside with a narrow entire white–penicillate corona at the mouth of the tube; tube 1·2–2·7 x as long as the lobes, 2·5–3(2·2–4·4) x 2–3(3·5) mm., urceolate or campanulate, often somewhat contracted in the throat; lobes triangular, 1·2–1·8 x as long as wide, 1·2–2 x 1–1·5 mm., acute, erect or suberect. Stamens included; filaments glabrous, 0·7–1·5 x as long as the anthers, inserted at 0·4–0·8 mm. from the base of the corolla; anthers oblong or elliptic, 1·2–1·4 x 0·8–1 mm., ciliate with a villose or sometimes pilose indumentum all around by which they are coherent. Pistil pubescent, rarely obscurely so, glabrous just below the stigma, 1·8–2·4(3) mm. long; ovary ovoid, broadly ovoid, or globose, (1)1·2–1·6(2) x 1–1·3 mm., 1–celled; stigma subsessile, oblong. One large globose basal placenta with about 60–120 ovules. Fruit yellow or when nearly mature yellow–green or green, large, hard, resembling an orange or a grapefruit, globose, often slightly shining, with granular skin, 7–11(15) cm. in diam., with about 10–100 seeds, immature often slightly pear–shaped. Wall rather thick, hard, 2–5(8) mm., thick, thickened inside above the pedicel. Pulp yellow, edible. Seed ochraceous in fruit, very pale brown when dried up, darkening in rotten fruits, obliquely ovate or elliptic, flattened, more or less plano–convex, usually irregularly curved, about 1–2 x as long as wide, 11 x 6 x 2–23 x 18 x 5 mm., mostly smooth, very shortly pubescent. 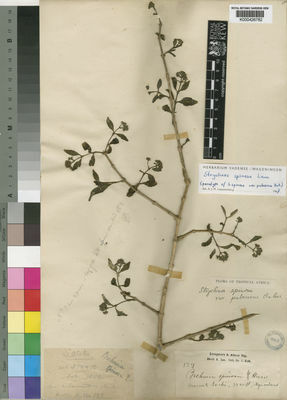 Shrub or small tree with spreading habit, up to 6.5 m. high; bark sometimes reticulate and irregularly corky but never thick; young branchlets varying from pale to dark mottled or concolorous, glabrous to shortly pubescent, sometimes longitudinally ridged and often powdery corky; spines slender to stout, straight or curved, sometimes absent. Leaves shortly petiolate; lamina membranous to coriaceous, ovate, obovate or elliptic, 3–8 cm. long, 1.3–7 cm. wide, rounded, subacute or more rarely acute or emarginate and often apiculate at the apex, cuneate or more rarely rounded at the base, matt or shiny, 3–7-nerved at or just above the base, with hair-pockets sometimes visible in the angles, indumentum of lamina varying on both surfaces from pubescent to glabrous. Cymes terminal; peduncle and pedicels spreading-pubescent. Calyx-lobes narrowly deltoid to linear, 3.5–5.5 mm. long, shorter or longer than the corolla, acuminate, usually glabrous except for the base, very rarely pubescent up to the lobes. Corolla greenish-white; lobes deltoid, subacute, about half the length of the corolla-tube, with dense hairs forming a ring at the base. Anthers densely bearded at the base. Ovary broadly ovoid, unilocular; ovules numerous. Fruit globose, 5–12 cm. 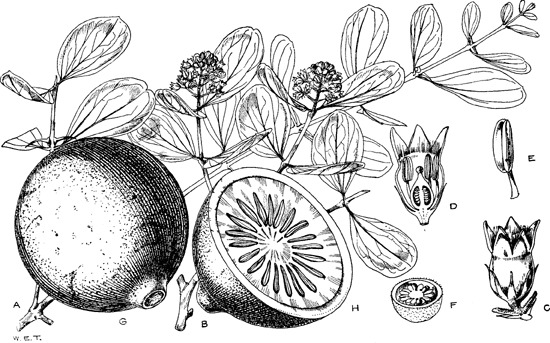 in diameter; rind woody, yellow; seeds numerous, flat and disk-like, 1.5–2 cm. long, embedded in fleshy yellow edible pulp. Strychnos volkensii Gilg ex Engl. Masharabu, T., Bigendako, M.J., Lejoly, J., Nkengurutse, J., Noret, N., Bizuru, E. & Bogaert, J. (2010). Etude analytique de la flore et de la végétation du Parc National de la Ruvubu, Burundi International Journal of Biological and Chemical Sciences 4: 834-856. Autrey, J.C., Bosser, J. & Ferguson, I.K. (eds.) (2005). Flore des Mascareignes 121-126: 1. IRD Éditions, MSIRI, RBG-Kew, Paris. Leeuwenberg, A.J.M. & Bamps, P. (1979). Flore d'Afrique Centrale (Zaire-rwanda-Burundi), Loganiaceae: 1-149. Jardin Botanique National de Belgique. Verdoorn in Fl. S. Afr. 26: 147. E. A. Bruce in Kew Bulletin 1955: 40 (1955). J.P.M. Brenan, Check-lists of the Forest Trees and Shrubs of the British Empire no. 5, part II, Tanganyika Territory p. 277 (1949). Duvign. in Lejeunia 13: 109 (1949). A. Chev. in Rév. Bot. Appl. 27: 355 (1947). Hutch. 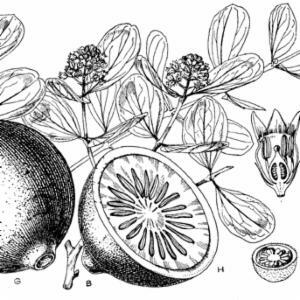 & Dalz., Flora of West Tropical Africa 2: 22, fig. 186 (1931) excl. syn. S. djalonis A. Chev. & spec. Chev. Baker in Flora of Tropical Africa 4 (1): 536 (1903), excl. spec. Welw. ex Loanda. Lam., Illustr. 2: 38 (1797).